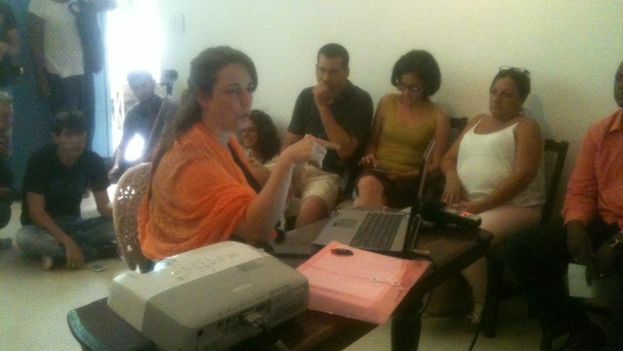 14ymedio, Havana, 16 July 2015 – Cuba’s Civil Society Open Forum launched a call for a plural and inclusive dialog at one of its regular meetings, on 16 July, in which it sent a letter to Pope Francis and a statement about the increasing repression of the Ladies in White and other activists. The request for dialog in this call is directed to the entities of civil society, the political organizations of the opposition, government authorities and the people in general. The letter to the pope was delivered to the Apostolic Nunciature by Catholic priest Jose Conrado Rodriguez, the lay pastor Dagoberto Valdes and the pastor Mario Lleonart, where Francis is asked to meet with representatives from Cuba’s civil society. In particular, the letter highlights the violence against the Ladies in White and their companions, and against the Patriotic Union of Cuba (UNPACU). As a consequence of these actions numerous activists have been victims of brutal reprisals. Some thirty activists, representatives of diverse organizations, discussed the possibilities and conditions under which they could engage in a political discussion with the powers that be. 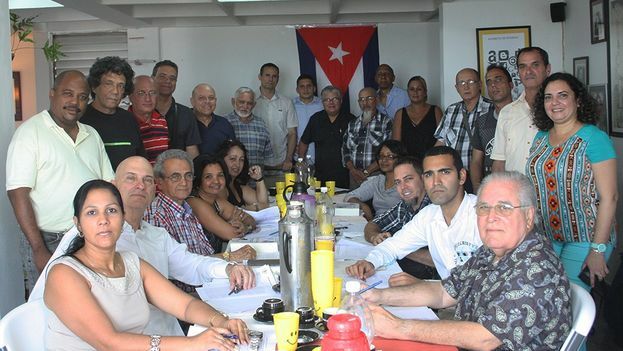 14ymedio, Havana, 8 May 2015 – Some twenty activists, political leaders, intellectuals and artists participated in a new meeting of Cuban Civil Society Open Forum last Friday morning. At the meeting they discussed the need to take into account in future discussions the organization of the parallel forums at the recent Summit of the Americas. The discussion touched on points such as the lack of transparency on the part of the State in the administration of public funds, the participation of independent candidates in elections and the current state of Cuban society. An intense discussion developed around several initiatives, such as “Citizen Hour” inscribed within the Constitutional Consensus project, which seeks to promote a new elections law, as well as a new law of associations and political parties. Also discussed was a proposal to create five working groups on the issues of human rights, democracy and governability, civil society, communications, and the private sector. Finally, it was agreed to send a letter to the European Union, the US government and the Cuban government expressing the deep concerns of the participants with the systematic repression against human rights activists and against the citizenry in general, which contrasts with the context in which they are promoting understanding and dialog. Among the participants were the artist Tania Bruguera and the writer Victor Manuel Dominguez. The attorney Laritza Diversent and opposition member Manuel Cuesta Morua also spoke at the event, along the analyst Pedro Campos and the Baptist minister Mario Felix Lleonart, among others. 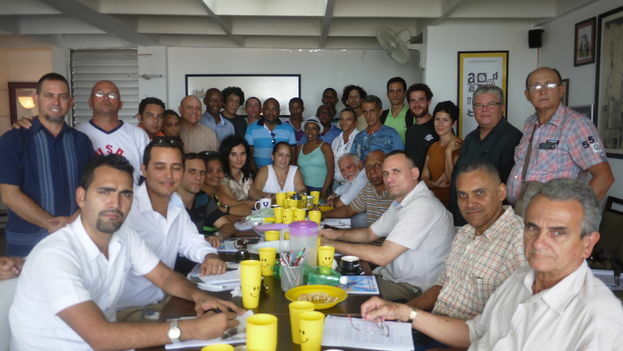 14ymedio, Havana, 25 February 2015 – The Cuban Civil Society Open Forum held its third meeting this Wednesday with 25 people attending, among them activists, opponents and members of civic groups. The first point on the agenda was the approval of a document titled “Ethical Path for Cuban Civil Society,” which lays out the basic principles that should be supported. Also under discussion were internal organizational issues relative to the inclusion and representation of the participants. A motion of solidarity with Venezuela (see below) was passed during the day and important agreements were made with regards to the attendance of Cuban civil society at the Summit of the Americas in Panama, to be held this coming April 10-11. Finally, those present were invited to make proposals about the elements and improvements that should be included in the next Elections Act, announced last Monday in an official note after the Tenth Plenum of the Central Committee of the Communist Party. around the table, while other activists weren’t present as they were participating events abroad or for other reasons. As has already been seen, a characteristic of the Open Forum is that discussion are of a frank character, marked by precise arguments and a thorough knowledge of the national reality. Among those attending (see below), the idea prevailed that Open Forum is emerging as a good opportunity for civil society to find new points of consensus, but without the intention of becoming a political coalition. The horizontality in which everyone keeps their own individual personality is one of the most notable strengths of this organization, which resists being considered a group to which people belong, because it prefers to define itself as a place where people participate. The independent Cuban Civil Society Open Forum meeting in Havana on 25 February 2015, has a approved a motion of solidarity with Venezuelan civil society and opposition victims of the repression unleashed by the government of that nation. We emphasize our support for the former member of the National Assembly María Corina Machado; opposition leader Leopoldo Lopez, who has already served a year in prison; and Caracas mayor Antonio Ledezma, elected by the popular will, recently imprisoned. We are pleased for the dozens of compatriots who will be released from prison and also by the release of Alan Gross. We believe that this ends the pretext and the official narrative of a besieged people, and that we must focus on democratic change in Cuba. We assume that the pressure from Cuban democrats within and outside the Island has contributed in a substantive way to the creation of this new scenario, and so we confirm that in the future we must expand the role of our civil society. We must listen to, reflect, and give voice to what the Cuban people are feeling at this time and offer them a new narrative, tactics and strategy, and a new language. We make a call to strengthen the unity in diversity achieved so far, whatever our opinions may be on this issue, and to maintain equanimity and respect. We expect that further negotiations will be carried out with greater transparency and will take into account all of the actors of Cuban society, without secrecy, and not behind the backs of institutions.